Last week I gave a talk at the Free Word Centre in London about the challenges of translating into English the language of Chinese food and cookery (it was part of a series organised by the two translators-in-residence, Nicky Harman and Rosalind Harvey). I gave a few examples of atrocious translations of dish names on Chinese restaurant menus, and then looked at some of the issues confronting translators, including the vast number of specialised culinary terms with no English equivalent, the culturally-specifice gastronomic concepts, and the wit and poetry of Chinese dish names. It all felt particularly relevant at the moment, since I’ve been grappling with the question of how to translate 豆腐 into English in my next book. In my previous books, I’ve translated it as ‘beancurd’, but my current editor favours ‘bean curd’, which to me looks a little awkward. Another option would be to use the standard pinyin transliteration from Chinese: dou fu. Meanwhile, the vast majority of writing in English uses the Japanese-derived term tofu. Anyway, I put out a call for ideas on Twitter. One kind person did a Google trends search which showed that the overwhelming majority of searchable texts on the internet call it tofu, while ‘beancurd’ and ‘bean curd’ are both minority usages. Gary Stephens pointed out that his Google searches brought up 36 million hits for tofu, 1.6 million for bean curd; and only 331,000 for doufu! Andrea Nguyen, whose new specialist book on the subject, Asian Tofu, will be out in February 2012, said she’d pondered exactly the same issue and ended up plumping for tofu as the one most suitable for her readership. Personally, I still find it a little weird calling it tofu because I’m used to saying dou fu in Chinese, so tofu doesn’t feel quite right. And as someone writing about Chinese food and culinary culture, shouldn’t I be advocating a Chinese-derived term when describing a foodstuff that has its origins in China? I suddenly noticed how many of the terms used by English speakers for Asian foods are derived from the Japanese: edamame rather than mao dou 毛豆 for green soybeans in the pod; daikon for luo bo 萝卜 white radishes; umami rather than xian 鲜 for delicious savouriness (although in that case, I have to admit that the Japanese may have been first to come up with the whole umami concept); yuba for beanmilk skin (which has various different names in Chinese); and now konnyaku or konjaku for mo yu 魔芋. In all these cases of introducing Asian food culture in the West, it seems that the Japanese simply got there first. In the end, though, I capitulated. 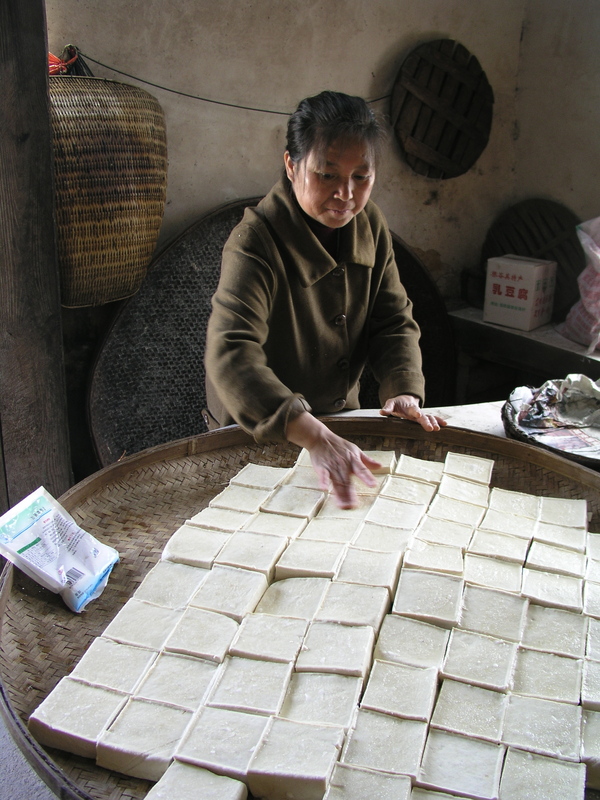 If tofu has become established as the standard English translation worldwide, and is the most recognisable term for those unfamiliar with Chinese cookery, it probably makes sense to use it in my recipes and my writing. I could try to run a one-woman campaign for dou fu or beancurd, but this might be at the cost of winning converts to the pleasures of Chinese food, which is, after all, the main point of what I do. So tofu it is. Hrrumph. I think tofu is the best term to use, at least in American English. I don’t personally think of “tōfu” as being specifically Japanese – the characters are the same, and the phonetic sound is basically the same (though not the tones). The Japanese word comes from the Chinese, as does, of course, tofu itself. The sound represented as ‘d’ in Hanyu pinyin isn’t “our” ‘d’ anyway – as I understand it, it’s more or less an unaspirated ‘t’, which I don’t think really exists as an initial in English. Older romanizations used ‘t’, hence ‘tao’; tofu was tou-fu in Wade-Giles. Or, in other words, “tofu” is just about as good a representation of 豆腐 as “doufu” is. Secondly, representing words in Hanyu pinyin can be problematic, since people unfamiliar with the system invariably butcher words. Obviously, it’s still the most consistent way to render Chinese words using western characters, but in the case of words which have already come into our vocabulary via other romanization systems, or transliteration from other Chinese languages, it can be quite confusing. But using ‘gong fu’ instead of ‘kung fu’ or ‘wulong’ instead of ‘oolong’ can be confusing to people, and maybe border on the overly pedantic. People know what tofu is, and they know it’s pronounced with an ‘o’ sound; people unfamiliar with pinyin might be inclined to pronounce ‘doufu’ ‘doo-fu’. Lastly, using “bean curd” can tend to make people think that one type of tofu (doufu gan, for example, or doufu hua) is “bean curd”, and all other types are “tofu”. So history will dictate the future use of words in culinary writing? To me it is rather odd like no recipe will ever change, chicken is prepared like that and basta. Nah, in this case beancurd is way better, a more palatble word I’d say. Let not the wisdom of the majority guide thee. Fuschia, I feel your pain. I have a similar problem in translating recipe titles back and forth between English and French. You have the additional issue of dealing with different alphabets. In a word like tofu, you have a word that now part of the English language. I know of no English-language dictionary that still treats it as foreign, only of foreign origin. And since the publication of “The Book of Tofu” in 1975, the use of the term “bean curd” has diminished greatly. (I prefer “bean curd” over “tofu” because it is a more precise translation of “dou fu,” but the marketplace has long overruled me.) The Americans that I was dealing with in the 1970s were much more accepting of “tofu” than “bean curd,” which sounded strange to them, “tofu” jst sounded exotic. In the 1970s, when commercially produced bean curd became available in supermarkets in my area—the San Francisco Peninsula—it was produced by companies with Japanese names and labeled: “Tofu.” Even the packaged brands available in Chinese markets were initially Japanese. This, of course, has changed today. The fresh, non-packaged, brands available are Japanese-style tofu, but the majority of the packaged brands are Chinese-style. Which brings up another issue with translating: How to best describe the firmness of the bean curd required for the recipe. Without being able to specify exact brand-names and varieties, this will always be imprecise. My suggestion for recipe titles in books and articles is to use both the original Chinese characters and the proper pinyin transliteration, even though most Westerners will mispronounce the words. For the English-language translation, use words appropriate for the market the book or article is being published in. are you by any chance in America?! I think there people pronounce it tow-fu, whereas in England it’s common to call it toff-u, with a short ‘o’, which is not like the Chinese. I agree that with a long ‘o’ it’s very close to the Chinese. I don’t think this implies any conservatism in actual recipes, it’s just about using terms that are commonly recognised. Yes, I’m in the US. But more to the point, it’s pronounced ‘TOE-fu’ not ‘TOFF-fu’ in Japanese, so while you Brits may have the moral high ground over us Americans in most matters of English pronunciation, you can’t really blame the Japanese for this one. I don’t speak or understand Japanese at all, so I’m not sure whether the Japanese ‘t’ is similar to the ‘d’ sound in Pinyin (which is really sort of a ‘t’), or whether it’s closer to a ‘t’ initial in English. I did ask a friend who’s a native speaker of Japanese, and she mentioned that in Japanese, the t of tōfu changes to a d when it’s preceded by another word, e.g., iri dofu (this helps explain why the Japanese word is romanized two different ways). 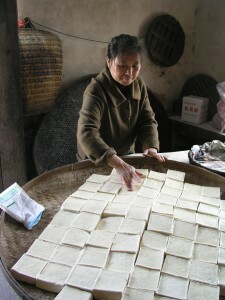 Tangentially related point; because most early immigrants to the US (and possibly other English-speaking countries) were from Toisan (Taishan) and other areas in Guangdong (or should I say Canton), most of the Chinese food words that have thus far made it into the English-language food vernacular come from languages in the Yuè language family. Bok choy, chow mein, char siew, and won ton come to mind (for bái cài (白菜), chǎo miàn (炒面), chā shāo (叉烧) and hún tún (馄饨)). Or we have names based on old romanizations of place names, often from the pronunciation in other Chinese languages – Szechuan peppercorns, Peking duck. With most other Chinese languages declining among young people, especially in Mainland China, and with the increased interest in studying Putonghua in the West, not to mention the increased immigration from the mainland, I imagine we’ll see more Chinese food words creeping into our vocabulary. It would be really handy to have an ingredient “rosetta stone” to try and keep track of all the various names and nicknames for food ingredients across different languages / countries. Of course, this would be hard to do with Chinese, because of some of the regional differences in food terms (one word may mean one thing in one area, but something else in another). I’m not a lingust, but I think this explains the d / t issue pretty well (as it pertains to dao / tao, but I think also a little pertinent here). The basic point is that the English ‘d’ and ‘t’ are both more or less equally inaccurate, though ‘d’ may be a bit closer to what native speakers of English perceive. As an American who speaks both Chinese and Japanese, and who has lived in China, but who now lives in New Zealand, I have been exposed to many different terms for 豆腐. When speaking in English with American non-Chinese speakers I generally call it “tofu”, since that is the most common term, but if they speak Chinese (or at least if I know they do) then I call it “dou fu”. However, with non-Americans I almost always call it bean curd, and that’s what I put on our menus here in NZ when I serve it to our guests. But more importantly, I’m thrilled that you have a new book coming out–any chance you can share what it will be about?? I really think you should use dou fu because even though I currently say tofu, I would like to be just as comfortable w dou fu and if you use it that will make the case that much stronger. I don’t want to use the Japanese word when speaking about a chinese recipe, and I think over time it could become just as popular – it just takes a leader and a few followers – you are perfectly positioned to take that leader position. Do it!!! people will search on your name or open your books to find your recipes – they will follow you! I think it is a transatlantic difference. Engish cookbooks tend to use ‘bean curd’ (with or without the space), while American ones usually use ‘tofu’. Whichever term you go with, please ensure your index uses both terms, since it is the index that has defeated me mroe than once. I say go with dou fu. Just because tofu is more accepted does not mean you should use it – look on this as an opportunity to educate people just a little. Perhaps a short paragraph in introduction to one of the recipes mentioning the two terms? Or if there is a section on ingredients you could mention it there. I really enjoy reading the short linguistic bits in your books. In fact, if you hadn’t mentioned that water spinach is often sold as ong choy I would never have realised that was what they were selling in Morrisons round this way, as the packets were not labelled with anything else. I remember the word beancurd being common in British cookbooks on Chinese food over thirty years ago, though that may just be the ones I had. But I think tofu is more common now. A curd made in Japan and China from mashed soya beans; bean curd. I think you should reserve a page in your book for exactly this purpose ~ to let your readers know that there are a few translations out there, but they all mean one thing. Thank you all for your very interesting suggestions! I think I’m going to stick to tofu with this book, but try to include all the variations in the index, and a brief introduction to the variant terms. Will – yes, it would be good to see more Chinese words used in English (just as we use French words like menu, restaurant and chef), and also Chinese concepts such as ‘mouthfeel’ (from kou gan 口感). The problem, of course, is that many Chinese words have exactly the same transliterations as one another, so it can be difficult to distinguish them in English – eg the crucial culinary words for salty – 咸 － and umami – 鲜 – have exactly the same transliteration – xian. Chinese does not lend itself to transliteration as readily as other languages for this reason. And what about all the dialects, as you mentioned: should 叉烧 be char siu (from the Cantonese) or cha shao (standard pinyin from Mandarin)? Margaret – thanks v much for the OED examples! Glad to hear there is another book in the works! Are you allowed to say what it is? I’m a huge fan of the stuff in all it’s varieties, but so far, the only (english language) book exclusively on the matter I consider worth owning is a small volume called TOFU! TOFU! TOFU! from Wei Chuan Publishing. I believe it’s out of print, but it can easily be found online. Thanks for the heads-up on Andrea Nguyen’s new book, I believe this might help fill a gap in my cookbook library. Now if I had any criticism on your previous books, it would be that the tofu section is somewhat too brief, I’ll be looking forward to see what news you’re going to add on the subject! We (i.e., my American) use ‘tofu’. Long o. No one I know would *ever* say ‘bean curd’, with or without the space. ‘Dou fu’, in a chinese cookbook, would be perfectly fine, since we’d say it the same way. I find that having the chinese name (in characters) and in pin-yin (with tones) is quite helpful when I’m trying to find an ingredient. I should tell you of my adventures trying to find fermented black beans in a Nanjing supermarket. Interestingly, before pin yin, no one ever pronounced Chinese words correctly. The common way to translate was to use the Wade-Giles method. In this method the “t” should have been spoken as a “d”, then it really would have been called doufu. “P” should have been spoken as a “b” and “K” as a “j” and Peking should have always been called bejing, not peking. So the problem of toufu or doufu is actually an old problem. I hated trying to learn the Wade-Giles pronounciation in college, but all was good when I finally mastered it. Then came along Pin Yin…lol. Today I much prefer the Pin Yin, but you will still see the old Wade-Giles. I don’t think that pinyin is the gateway to correct pronunciation. Just like other systems of romanization, hanyu pinyin isn’t designed to be pronounced phonetically as speakers of English or other western languages would say it. It’s just a consistent way of transliterating the sounds that make up spoken putonghua. As mentioned above, the sound represented as ‘t’ or ‘d’ isn’t really exactly the same as either one in English. There are plenty of other initials and finals in pinyin that are nothing like how they would be pronounced in English, which is why we continue to hear lots of Chinese words butchered. “Peking” isn’t Wade-Giles for “Beijing”, and, I believe, its use to refer to Beijing may even pre-date that system. If memory serves, it’s not even a transliteration of the word in putonghua, which may explain why it seems so far off.